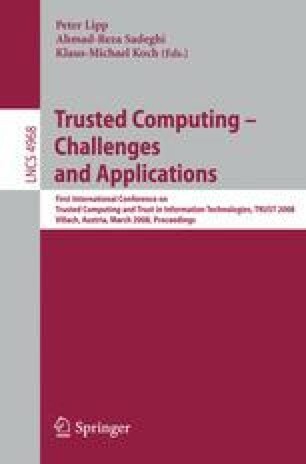 The concept of Trusted Computing (TC) promises a new approach to improve the security of computer systems. The core functionality, based on a hardware component known as Trusted Platform Module (TPM), is integrated into commonly available hardware. Still, only limited software support exists, especially in the context of grid computing. This paper discusses why platform independent virtual machines (VM) with their inherent security features are an ideal environment for trusted applications and services. Based on different TC architectures building a chain-of-trust, a VM can be executed in a secure way. This chain-of-trust can be extended at run-time by considering the identity of the application code and by deriving attestable properties from the VMs configuration. An interface to provide applications with TC services like sealing or remote attestation regardless of the underlying host architecture is discussed.